The Kaito KA007 is the perfect low-cost emergency receiver. This self-powered radio tunes the bands you need to hear during a crisis. 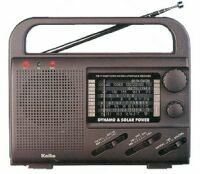 It receives AM, FM, NOAA weather, VHF High Public Service, VHF TV audio (2-13) and four shortwave bands: 4.0- 9.0, 9.0-14, 14-19 and 19-26.1 MHz. The KA007 rear panel has a built in solar cell array for internally recharging 3 NiMH AA cells (not supplied). There is also a built in hand-generator. Or the radio may be operated in a conventional manner from three AA cells (not supplied) or the included AC adapter. This radio is an ideal economical emergency radio. It even features a built-in LED light source. The KA007 comes with: AC adapter, earbuds, wrist strap and soft wire antenna. Size: 6 1/2 x 5 1/2 x 2 1/4 inches. Ninety day limited mfg. warranty. NOTE: Effective 02/17/09 American TV stations will convert to digital signals and change frequency. Radios that currently receive TV audio will no longer be able tune TV audio.